The course was introduced in Feb 2002. Since then 3200+ users have benefited from it. 17 editions have been printed till date. 365 Days No-Questions-Asked, 100 % Money-back Guarantee. The guarantee is printed on the very first page of the course. 2650 users started speaking in English in first 99 Days. Others took longer than that. You need to study for 27  45 minutes a day. 3650+ users in 10 Years are the proof that these scientific techniques really help you in speaking in English. Also, we have tested it with 1300+ people in personal coaching. It uses our brain in very effective ways with the techniques that were known 107 years ago. The mistakes made by most Marathi speaking people – Mistake 1  Many people focus on delivery instead of focusing on content. Mistake 2  They should concentrate more on what they want to speak and not how. Mistake 3  They concentrate more on what they want to speak and not how Mistake 4  They pay attention to what other person think of me? When they should actually listen to what they are saying. 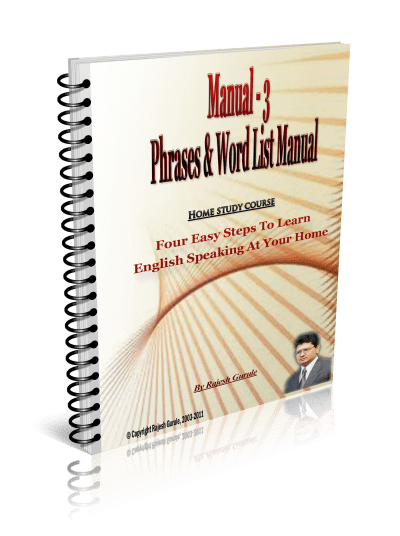 Mistake 5  Still other keep on repeating sentence in their mind instead of saying few words. Mistake 6 – It is astonishing how many Marathi speaking people chase to keep quiet even though they know much more about the subject then other. Why Most Marathi Speakers Make Mistakes? What is the reason so many of us are not efficient in English speaking & find our careers halted at the same point? Why so many find themselves at a loss for words to express their meaning adequately? The reason for this is clear. Ive discovered it in countless tests & interactions with people. Most persons do not speak good English simply because they never formed the habit of doing so. The formation of any habit comes only from constant practice/application of fundamental principles. No one who speak English confidently think of rules when he is doing so. Here is a language that is used by most of the worlds population; that we study for at least 5 years; that we are so good in writing! Yet we find it is so difficult when we need to speak in English. It happens because of wrong methods we learn in school. School teachers made it hardest, instead of most fascinating of games! What will you get when YOU will start speaking in English? Vacations with your family ? Promotion in Your job ? I have got all these. And the credit goes to my ABILITY OF Speaking in English ! ! ! Here lies the real difference between my English Speaking Home study courses & other courses and Classes. but I could not speak in English.I spent countless days & weeks in pain because of this. Nothing helped me. 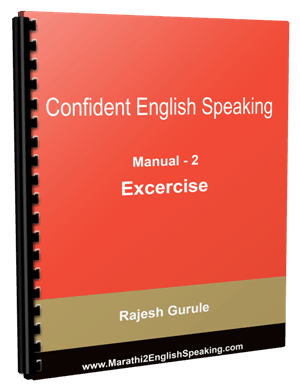 But when I started applying the habit changing method given in this English Speaking Home Study Course, I started speaking within few days with anybody on any topic & in any situation. It was simply amazing. My whole life changed because of this one thing. Otherwise I would be working at some job paying me 40,000-50,000 per month. So about 9 years ago, I started coaching some M.B.A students, engineers & others these principles and methods. And to their surprise, most of them started speaking in English within few weeks. 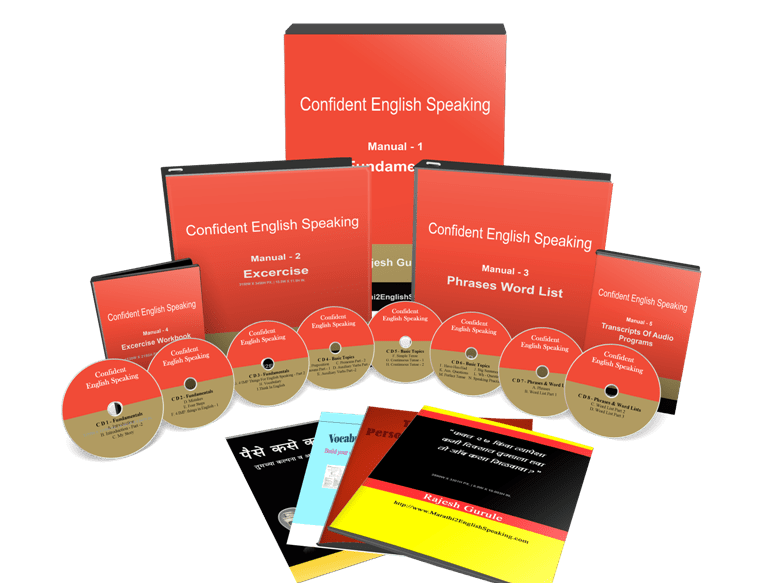 After 2 years of personally coaching hundreds of people in English speaking skills, I developed this home study course. It is totally based on same principles that I have used in those classes. And all of them, not only learn speaking but also enjoyed the learning, too. The basic principle of this course is habit forming. Any one can learn to speak effectively by constantly using the principle & methods Ive given. Its like I am personally there with you,coaching you, guiding you every step. I would be there with you. Explaining the concept as many times as it takes for you to understand. If you continue to face same problems over and over again, each time I would tell you how to solve it. I would be mentor beside you- a mentor who would not laugh at you, but who would on the contrary, support and help you. Components of the course What you get in this course? As shown in the photo, you get everything included. Here is the list- Now here are the various components you are getting. 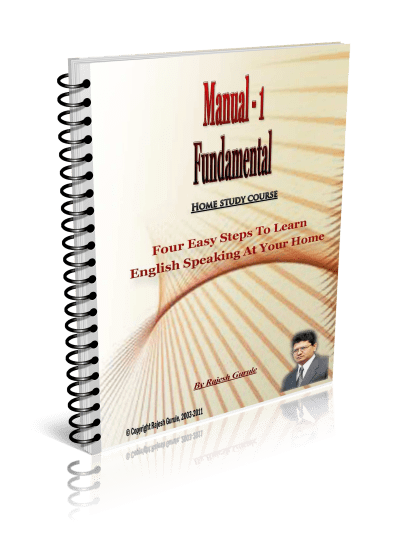 ALL the things you need to speak English easily, are in this manual. This is the core of the whole course. 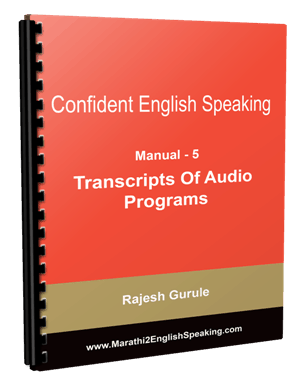 If you are the person who loves to read than listen, then you are going to find these transcripts very useful. 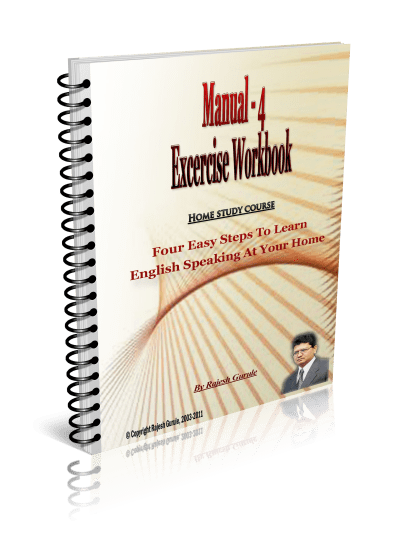 95 Effective exercise are given in this exercise manual. They help to do practice on your own. In this manual, you can practice to your hearts content. You are given lots & lots of area to solve the exercises. 1800 + words & 280 + phrases are given in this. These are the most commonly used words in English Speaking. 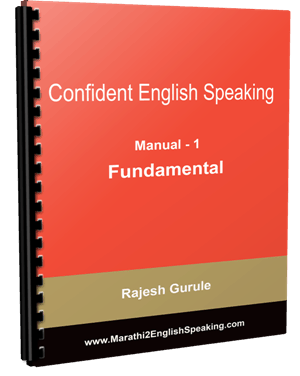 Component 3  English Speaking Cards x 3 Sets I have specially designed these cards  which are very simple but very effective. You will love using them. But thats NOT all. If you order today, you will get these Special Bonus Gifts also  absolutely FREE! 1.  How To Get Any Job In 27 Days  Book + CDs Regular Price = Rs 270/- This will help you in getting your job in 27 days or less. I have taught the principles in this to hundreds of students, and they got very positive results with this material. You will get this as my gift to you. the all the bonus gifts are yours to keep no matter what, as a thank you gift from me! And You can keep ALL the bonuses for giving this a try. Okay? So you really cant lose! The Course is yours no matter what. You get 100 % Money Back Guarantee for 1 FULL year,also. Now here are the various components you are getting. So order right now. Here is how you can order for this course today – 1. You can deposit the money in my HDFC Account.Or you can do online transfer. The details are – Account Name -RAJESH BAJIRAO GURULE ACCOUNT NUMBER  00641000161375 ISFC NUMBER  HDFC0000064 PLACE  NASHIK Immediately Ill send you the course. Your Price = Rs 3,970/- You get 100 % Money Back Guarantee for 1 FULL year,also. Yours truly, Rajesh Gurule P.S.-Everything to get you started in speaking English in 4 simple & easy steps 4 Most important things you need to speak English  & NO, good grammar is not one of them! The reason why a Maharashtrian Person cannot speak English  even after learning it in school for minimum 5 years. So if you really want to speak English easily, this is the opportunity youve been waiting for. P.P.S.  If you are still undecided, get the first 2 chapters of this course. After reading them you can decide yourself. And the best part is they are free for you to download. I have added various resources for you. You can access them all on Resources pages such PDFs, Articles & Videos. Hello Rajesh, I am an Engineer. I was facing so many problems in communicating in English with others. I tried few English Speaking Courses but nothing helped me much. But when I got your course & studied it, it was really amazing. I find the concepts explained in a very easy to understand way. It helped me in really knowing what was the problem & why I couldnt speak English. My name is Rajesh Gurule & just like you I am from Marathi medium. I am Mechanical Engineer. & I completed my studies from Janata Vidyalaya, Satpur, Nasik. I learned English Speaking myself from these methods & taught them to hundreds of students in last 7 years. I learnt the process in 1992-93 when I was doing my Engineering. But it took me almost 9 years to refine & make this system foolproof. So that I am able to teach English Speaking to anyone without  going to classes; without needing anyone to practice with; in your home or office. I boiled down the process to 4 easy steps. Just master these steps & immediately you can start speaking in English. If you dont have time to go to class, then too you must be able to learn English Speaking. 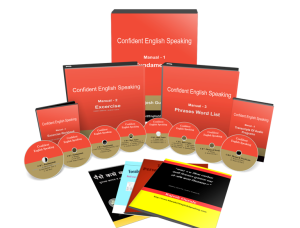 If you dont want to attend the class, you can speak in English using the methods in this English Speaking Course. 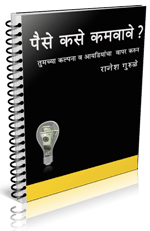 This course is designed for you  Marathi speaking person. So you must be able to understand Marathi. This is the result of years of hard work & research. Yes, I want to order this course.